A group of townies hoping to show their worth get an opportunity to compete against the more well-off college kids in the Little 500 bike race. 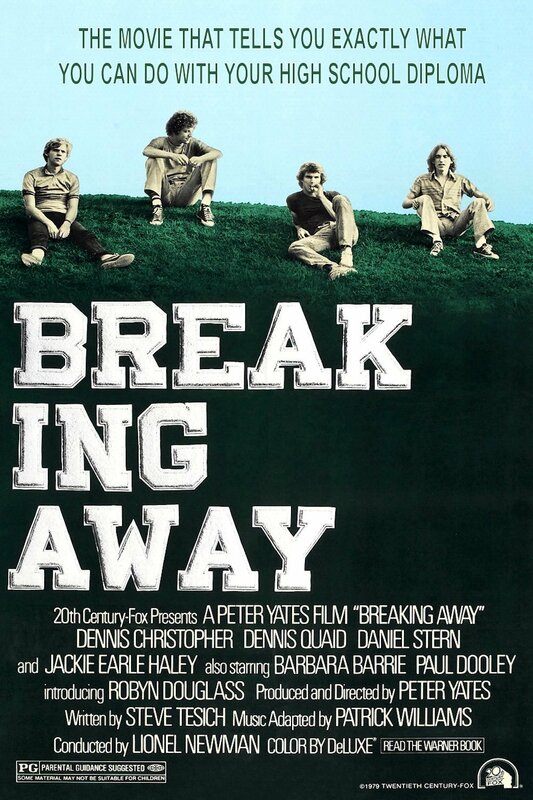 "Breaking Away" is directed by Peter Yates, who is known for films like "Bullitt" and "Krull." It is written by Steve Tesich, who took home an Oscar for his original screenplay here. The narrative focuses on a group of 'Cutters,' which is a nickname given to the blue-collar townies from Bloomington, Indiana. Dave, played by Dennis Christopher, is a cyclist who is obsessed with Italy and its people thanks to its extraordinary bike riding heritage. Mike, played by Dennis Quaid, is a former high school quarterback with a chip on his shoulder. Cyril, played by Daniel Stern, is a bit of a goof and is an underachiever. Finally, Moocher, played by Jackie Earle Haley, is a temperamental guy who is a little touchy about his height. These local boys often have conflicts with the local university students, who come in from out of town and look down their noses at those who choose not to pursue higher education. However, this year, the Cutters have a chance to show the college kids what's what by competing in the annual Little 500 bike race against them. This film is part coming-of-age story, part exploration and dissection of classism, and part classic underdog sports tale. It also looks at the changing times and the diminishing opportunities for a blue-collar career. The nickname 'Cutters' is in reference to the stone cutters, who used to work the quarry in Bloomington. Of course, the quarry has now laid off most of its workforce due to the dwindling demand for new stone structures. This leaves those who used to work in these industries forced to search for jobs outside of their previous field of employment or seek out higher education and become one of the college elitists the Cutters used to despise. This issue continues today as more and more blue-collar industries dry up as technological advancements make these jobs more obsolete. The character of Dave is the primary focus of the movie as he tries to find himself as a person, come to an understanding with his father, and make a decision about what he wants to do with his life. He is smart enough to go to college and is a skilled cyclist, giving him a potential collegiate athletics opportunity. The other boys play a much more minor yet integral part of the story. The acting is great across the board. Jackie Earl Haley is excellent as Moocher, who is a bit of a goofball but will go off on anyone who makes fun of his height or his size. Dennis Quaid is also good as the bitter jock reminiscing about what could have been. Barbara Barrie earned an Oscar nomination for her understated, small-scale performance as Dave's supportive mother. Performances like this don't happen very often nowadays. There is a good amount of humor here, as well as some more touching and dramatic moments between Dave and his father, played by Paul Dooley. Dave's dad is an old-fashioned kind of guy who has trouble grasping his son's eccentricities and obsessions with Italians. He frequently belittles what Dave loves in his confusion. "Breaking Away" is nearly 40 years old, but is still quite relatable, fresh, and entertaining. It touches on a few topics that are still very relevant today and it holds up in terms of its quality. If we are being honest, we don't think a film like this would get nominated for an Oscar today, but the late 70's were different a time.